After declaring I now own a pair of Ross Geller leather trouser on Facebook I decided to carry on with my 'Style Me Up' series and show you how I'd wear my new purchase. Seeing Kristine, who writes over at My Bowl Cut, wearing these trousers made me green with envy. I NEEDED a pair, they went into the sale on River Island website and at £20, they were added to my basket without a second thought. Sadly they are now sold out online, ASOS still has them at full price, but otherwise check in your local store, they might still have a few pairs. A simple grey tee is the perfect accompaniment to the leather trousers, it will let the accessories do the talking and of course I love Topshop basics. Zara can do no wrong in my book! These heels are AH-MAZING! They also come in black for those not so brave on the colour front. Grey being a 'cool' colour looks better with silver so I picked these spiked hoops. 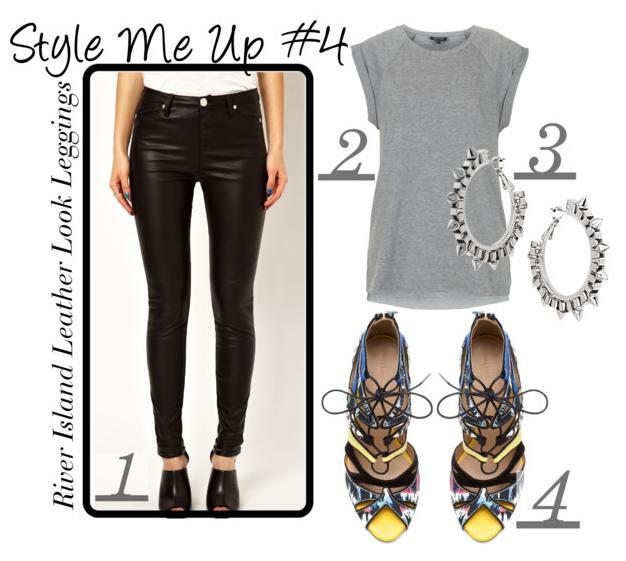 What would you style leather leggings are trousers with? Oh my god I NEED these leggings! Boo at being sold out online..
oh god seriously amazing heels and super sleek leather pants! Leather look trousers are amazing. I love how you style them. Simple t-shirt and good shoes are the way forward. Those leggings are great. can't believe they're in the sale!! Love this outfit! And sale bits too, this is a bit tempting!